The air is crisp, the leaves are changing, and there are pumpkins every corner you turn. This can only mean one thing: it’s fall! If you’re not about infusing pumpkin spice into everything you eat and drink, then we have a better alternative plan for our Wendy Watchers. Get outside and enjoy the scenery before you start to hibernate. Here are the best places to visit this fall. 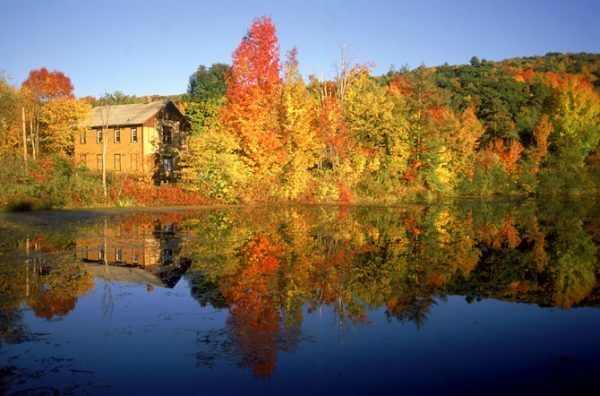 Located in western Massachusetts, the Berkshires are not short of activities for you to do while enjoying the fall foliage. The scenery is so good, that the Berkshires have an entire festival dedicated to it. For over 60 years, the Fall Foliage Festival has been a Massachusetts staple. Who says the fun in Jersey ends when summer does?! Cape May is one of the oldest shore towns in the United States, and the small town vibe is at an all time high here. Once fall starts, the Victorian town experiences a makeover, and the autumn happenings take way. One of the notable Cape May experiences are the Halloween themed tours in October. In a town that was founded in the late 1600s, we’re sure there’s a lot of spookation to be seen. The luxuriation of it all! Napa Valley is the place to go if you want to getaway with your significant other or your girls. Enjoy the scenery with a glass of wine, and hit up the spa when you’re done. There’s plenty to do in Napa Valley, but we’re gonna take a wild guess and assume our Wendy Watchers will be more than pleased with a relaxing morning at the spa, some Napa wine during the day, and exploring the nightlife scene after a disco nap. Colorado is known for their ski slopes (amongst other things). It’s also one of the best places to experience fall, specifically Snowmass. Snowmass is the perfect place to be when you need a little escape, but don’t want to be completely out of touch with the world. We are especially into the idea of experiencing the Aspen Film Festival, which is less than 20 minutes from Snowmass. You’re bound to run into some celebrities there, and enjoy a few movies. Never heard of Taos? It just might become your new favorite place. “Far away from the every day,” Taos lives up to its slogan. This is where you go when you’re in need of a little rejuvenation. After all these years, Taos has stayed true to its roots. If you want to see the beauty that is fall in New Mexico, you must travel through the Enchanted Circle. We know it sounds insane, but hear us out! The Enchanted Circle is an 85-mile scenic byway that immerses you through valleys, mountains, rivers, and wildlife. Rent a convertible, and take the day to drive around. You won’t regret it! Kodak Black keeps rolling on in the self-directed video for “I N U,” his latest loose single. To start the clip, which was edited by Lil Kodak and Wavylord, Project Baby rolls around on the floor, while repeatedly screaming about how he doesn’t eat baby food. Then, accompanied by a baseball bat, he rolls around the city in a black Range Rover. The controversial rapper, who’s on house arrest, tries to pass the time by counting, ironing, and lighting money on fire. He also tries to light a gaming system remote on fire, then walks around with an electric drill before slamming his head on the car’s steering wheel. Throughout his verses, Kodak raps about being a baby, even though he has a child (“I’m a baby with a baby”) and even though he’s about to be an uncle (“My brother ’bout to have a baby / ‘Bout to be an uncle and I’m a baby”). He also raps about getting calls from the Department of Children and Family Services, and about his views on education. Directed by Bussa Bus and Benny Boom, the cinematic visual kicks off with Busta arriving at the Norman Manley International Airport, where he’s greeted by Beenie Man. From there, the duo sails out on a yacht with Spliff Star and a bevy of beautiful models. Before heading out to a special party, the Conglomerate boss stops by the local prison, to check on Vybz Kartel, who films his scenes in a dimly-lit jail cell. Afterwards, Tory Lanez performs his verse at a wild bash, where he’s surrounded by more gorgeous women. The clip, which features cameos from Ninja Man, Junior Reid, Foota Hype, Spice, and Bounty Killer, arrives ahead of Busta’s next album, the follow-up to 2012’s Year of the Dragon. Head to Jamaica with Busta and friends below. Chris Brown is teaming up with Ella Mai. After the DJ Mustard protégée shared a photo of the duo in the studio, Breezy posted a snippet of what fans can expect from their forthcoming collaboration. Over what sounds like Mustard’s production, Ella can be heard harmonizing with Breezy, on a track about infidelity. Ella has called Breezy her second biggest influence behind Lauryn Hill. “I couldn’t tell you what it is about his music that connects with me, but it’s there, and it’s been there since I was 10 or 11,” she told The FADER. In May, Ella celebrated the fact that Brown posted a video of himself, bopping to one of her songs. “i remember being 13 with a pink ipod and the only music on it was @chrisbrown. HUGE inspiration to me! lost for words,” she wrote. Ella has also posted several covers of Breezy songs, including “Back to Sleep,” “Play No Games,” “New Flame,” and more. The longtime supporter has even shared her collection of Chris Brown albums through 2015. In February of 2016, Brown started following Ella on Instagram. To celebrate, she posted a reflection on her early years. “in highschool i used to tell people chris brown will know my name one day & everyone used to say stop dreaming,” she wrote, with a screenshot of his follow. For now, it’s unclear where the song will land, but it could very well appear on the follow-up to Ella’s Ready EP. Meanwhile, Breezy is still prepping the release of his long-awaited double album, Heartbreak on a Full Moon, which is set to drop on Halloween. I think oatmeal gets such a bad rap. 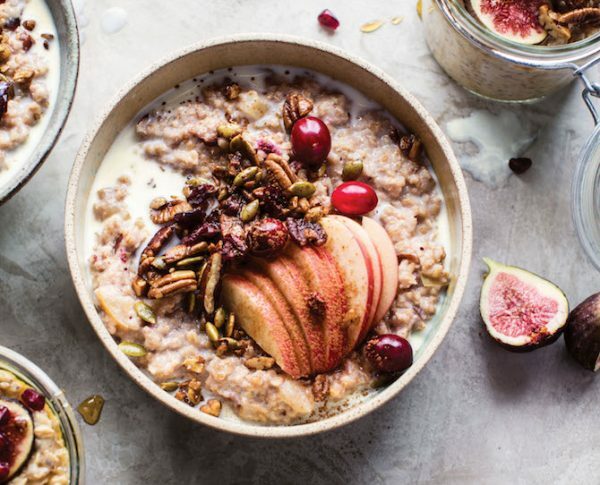 We all know oats are good for us, but that doesn’t mean they have to be boring. Enter these two crazy-easy oat recipes. They’re perfect to make ahead the night before, then just grab and go in the morning. There are two ways to make them. The first method is to combine the oats in a jar or bowl and allow them to sit in the fridge overnight. The second method is to combine everything in your slow cooker the night before and let it cook low and slow—when you wake up, your kitchen will smell amazing. What I love about this recipe is that you can change up the flavors depending on the seasons. In the fall, I’ll top my oats with apples; in the winter, fresh citrus; in the spring, strawberries; and in the summer, stone fruits. 1. In a medium bowl, stir together the oats, milk, mashed banana, yogurt, coconut, honey, chia seeds, vanilla, and salt until well combined. Divide the mixture evenly between two bowls or two 8- to 12-ounce glass jars. Cover and refrigerate for at least 6 hours or overnight. When the air turns crisp and the leaves begin to change colors, my apple obsession kicks into high gear, and I begin to focus all my creativity on cooking and baking with apples. Enter this soup! This is the ultimate in fall comfort food. If there’s one recipe to make when the weather starts to change, this should be it. The Brie pairs so well with the sweet apples and autumn squash. Top oﬀ your bowl with savory pumpkin seed and bacon granola and this recipe will be one you return to year after year! 1. In a large stockpot, heat the oil over medium. When it shimmers, add the onion and season with a pinch each of salt and pepper. Cook, stirring frequently, for about 5 minutes, until softened. Slowly add ⅓ cup of the cider and let it cook into the onions. Repeat until all the cider has been added and the onions are caramelized, about 10 minutes total. Add the apples, squash, and thyme and cook over medium heat, stirring, until softened, about 8 minutes. Add the beer, 3 cups of the broth, and the cayenne. Increase the heat to high, bring to a simmer, and cook for 15 to 20 minutes, or until the apples and squash are tender. 2. MEANWHILE, MAKE THE GRANOLA. In a large skillet, cook the bacon over medium heat until crisp, 3 to 4 minutes per side. Drain on a paper towel–lined plate. When cool enough to handle, coarsely crumble the bacon. 3. In the same large skillet, melt the butter over medium heat and cook until just beginning to brown and smell toasted. Add the oats and pumpkin seeds and cook for 1 minute more. Remove the skillet from the heat and stir in the crumbled bacon. Season with salt. 5. Return the soup to the pot and set over medium heat. Stir in the milk, then bring the soup to a low boil. Stir in the cheddar and Brie until melted and smooth. Add more broth to thin the soup, if desired. Simmer for about 5 minutes more, or until ready to serve. 6. Ladle the soup into bowls and top with the granola. I am so excited about this pie, and for more reasons than you’d probably think. Yes, it is insanely delicious, but perhaps more important, I want to chat about the fact that it has treacle butter. If you don’t know what treacle butter is, you are obviously not as big a Harry Potter freak as I am. That’s fine, but then I need to explain a bit. Treacle, also called golden syrup, is basically the British form of blackstrap molasses, and it happens to be one of Harry Potter’s favorite flavors. I added flaky sea salt and butter to make salted treacle butter. Now, I fully realize that might not sound like the best thing ever, but I am here to tell you that it is the best thing ever. Slather the butter over the entire pie just as it comes out of the oven, and you will soon realize just how brilliant this combination is. 1. Grease an 8-inch pie plate with butter or cooking spray. 2. On a lightly floured surface, roll out the pie dough into two 12-inch rounds. Carefully transfer one round to the prepared pie plate, lifting up the edges and allowing the dough to sink down into the bottom of the dish—don’t stretch it. Trim the edges if needed, then prick the bottom of the dough with a fork a few times. 3. MAKE THE TREACLE. Stir together the butter and molasses in a small bowl. Add the salt and stir to combine. 4. Pour half the treacle butter into a large bowl and set the remainder aside for serving. Add the apples, brown sugar, flour, cinnamon, nutmeg, and lemon juice. Toss until everything is evenly distributed. Spoon the mixture into the piecrust in the dish. Be sure to scrape in all the good juices from the bowl. 5. Place the second pie dough round on top of the apples. Push the edges of the top crust against the pie plate and crimp the edges of the bottom crust together with the top crust to seal the pie. Alternatively, roll out the top round, cut the dough into strips, and create a lattice top (see photograph, page 256). 6. Brush the top crust with the beaten egg. Using a sharp knife, cut four slits into the top crust to allow steam to escape. Cover with plastic wrap and chill in the fridge until the crust is firm, at least 1 hour. “Half Baked Harvest Cookbook” is available now. Busta takes it back to his roots in this short film. From the shores to the streets, it’s one big party in Jamaica in his new music video featuring Vybz and Tory Lanez. JAY-Z brought his 4:44 so Saturday Night Live for the show’s 43rd season. With Ryan Gosling as host, HOV performed “Bam” alongside Damian Marley in front of a camouflage backdrop with a Colin Kaepernick jersey on supporting the NFL protests. Jiggaman than returned and toned things down with a rare performance of the album’s personal and title track. “Saturday Night Live” kicked off its 43rd season with some help from host Ryan Gosling and musical guest JAY-Z. In his first televised performance this year, the hip-hop icon delivered two songs, “Bam” and “4:44,” off his chart-topping album 4:44. Rocking Colin Kaepernick’s “7” jersey, Hov was joined by Damian “Jr. Gong” Marley for a electrifying performance of their reggae-inspired banger “Bam.” Against the red lights and camouflage backdrop, Hov blessed the No I.D. beat, while Damian repped for his native Jamaica as a Lion of Judah flag waved across the stage. Watch his “Bam” performance below. For his second performance of the night, Mr. Carter stripped things down. Sporting a paper plane snapback, Puma sneakers, and a white tee, Sir and Rumi’s father took the mic alone to perform the confessional title track off “4:44.” Against a bare set, he rapped about his rocky relationship with Beyoncé until the lights eventually faded to black. Next up, Hov is set to bring his live show to a city near you when his “4:44 Tour” kicks off Oct. 27 in Anaheim, Calif.